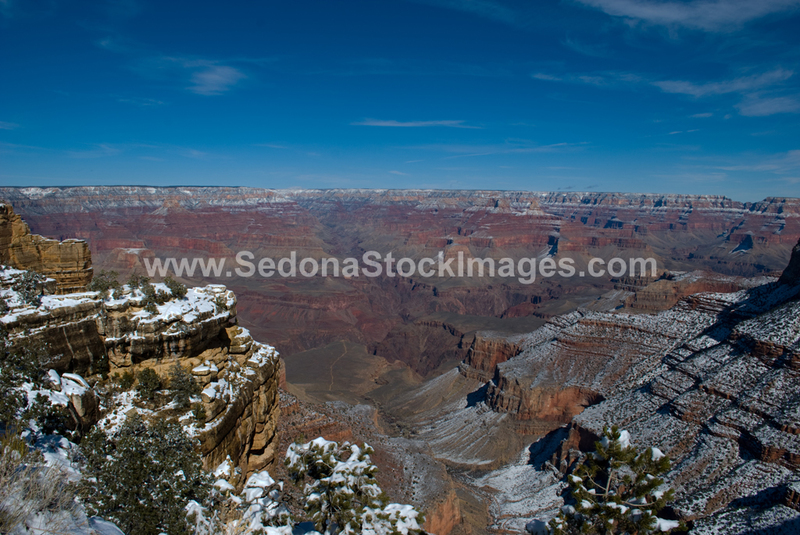 Photo ID: GCSnow2929.jpg South Rim of the Grand Canyon in winter. View from Trailview Overlook (6,860 ft high) showing the Grand Canyon's five geologic layers: FIRST TAN LAYER includes white Kaibab Formation (270 million years ago), gray Toroweap formation (273 m.y.a.) and yellow Coconino Sandstone (275 m.y.a. ); SECOND RED LAYER includes rust Hermit Shale Formation (280 m.y.a. ), pinkish red of the Supai Group (315-285 m.y.a.) and red Redwall Limestone (340 m.y.a. ); THIRD DARK GRAY LAYER includes light gray Temple Butte Formation (385 m.y.a. ), dark gray Muav Limestone (505 m.y.a.) and light gray Bright Angel Shale (515 m.y.a. ); FOURTH RED AND BLACK LAYER includes red shale, limestone and dark lava of the Grand Canyon Supergroup (1,200-740 m.y.a. ); and, FIFTH BLACK ROCK LAYER at river level (2,450 ft high above sea level) includes Vishnu Basement Rocks (2 billion years ago) which came from tectonic plates colliding and squeezing molten rock up through cracks to become the basement of the Grand Canyon. THE GRAND CANYON BEGAN when the Colorado River started carving through the rock layers 5 or 6 million years ago.